Cuttack: President Kovind delivers the Foundation Day Lecture of National Law University, Odisha. CJI Dipak Misra, Governor SC Jamir, CM Naveen Patnaik, Union Minister Dharmendra Pradhan and HC Chief Justice Vineet Saran also present. President Ram Nath Kovind says for all its advances, at its root the legal profession has a simple aspiration – for the lawyer to be a voice for the voiceless and to bring justice to the most deprived. NLUO has become a major centre for legal education in not just Odisha but across our country. It is recognised as a centre of excellence, attracting students from 25 of India’s 29 states says President Ram Nath Kovind. Modernisation of the legal profession has kept pace with the rise in opportunities for young lawyers. 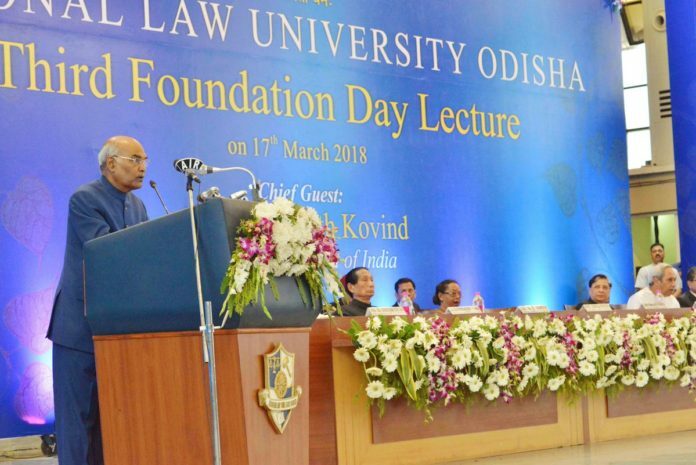 While litigation in courtroom remains at the core of legal practice, a law graduate today finds many avenues open that were not available to previous generations says President Ram Nath Kovind. As our economy has grown, the legal profession too has expanded. Commercial and business law have become more important, complex and intellectually stimulating. If this is true domestically, it is also true internationally says President Ram Nath Kovind. Trade and commerce, international agreements and even diplomacy increasingly turn to lawyers and legal minds for negotiations and drafting of texts. Arbitration and globalisation of legal services have linked today’s lawyers with the rest of our planet says President. Lawyers are called upon to develop regulatory frameworks for and in extremely dynamic & evolving technological environments. This has been true for cyberspace & for Internet law. In the years ahead, legal practitioners will have to meet many more such challenges says President. Lawyers will have to create rules and legal frameworks for outer space, for the Fourth Industrial Revolution and for Artificial Intelligence. They will have to write laws for new equations between humans and machines says President in his address. NLUO is equipping its students in new fields. Using the Govt of India’s GIAN programme, it has offered courses in international e-commerce law and in corporate governance in India. These have involved guest faculty from the United States and Singapore. ‘I have spoken earlier of need to enhance legal literacy and simplify legal rules – as well as for quick availability of certified translated copies of HC judgements in the local language of the state. Some High Courts have responded to this positively,” says President. Our legal system has a reputation for being expensive and for being prone to delays. Use and abuse of instrument of adjournments is often done by advocates who see adjournment as a tactic to slow down proceedings, rather than a response to a genuine emergency says President. These are issues for the emerging generation of lawyers to ponder. Opportunities & rewards of this profession, both intellectual and financial, are enormous. But a good legal professional is not just somebody with a mind; he or she is also somebody with a heart says President.